Becca and Brian's Grand Adventure: What was your favorite place on the trip? As we reenter the US and have the opportunity to visit friends and family, this is the number one question we are asked. Though special props have to be given to a former co-worker of Becca’s who asked if we’d picked up any rare or tropical diseases. In case anyone is concerned, the answer is no. The question of which was the favorite place on our trip is a difficult one to answer. There are just so many memorable moments and places after a trip like this that it is impossible to narrow it down to just one. My answer to date has been "horses for courses". (As an aside: is anyone familiar with this term? I've gotten more blank stares in using it that I feel like I'm using jive talk from old movies from the 30’s and 40’s) In short, I’ve had different favorite places depending on the type of activity; city v. outdoor activities v. cultural, etc. The more I think about it though the more I realize there isn't really an answer to the question. I've already forgotten about more places from this trip than I'm bound to remember or realistically get to go to moving forward. Becca has no problem remembering every place we’ve been but for me they tend to come and go depending on my mood and what is currently on my mind. Think of it as Mensa v. ADD. So for me, there isn’t a true answer to the question of what was my favorite place on the trip. But people still ask the question so it helps to have an answer for them instead of a blank stare (or so I’ve found). As a result, I’ve decided to focus on something different in coming up with an answer. My brother-in-law and sister-in-law do a great thing after a trip where they ask themselves what was the most memorable thing for each of their five senses. This is a distinctly different approach that leads to some unique insight both into the trip itself as well as the person giving the answers. It works great for them and it's entertaining to ask "so what was the most memorable smell from your trip with us to Alaska?" For me though the more I think about this opportunity we've had the more I think that the answer isn’t a particular thing or place. It's simply moments in time; just those opportunities where circumstances come together in a way where you're reminded what an adventure you're truly on. -- Sitting on a silent beach in Nida, Lithuania just listening to the waves crashing in. -- Holding Becca as we did a memorial for her Dad's one-year death anniversary in the Swiss Alps. -- Watching the 250 Olympakios fans go absolutely bonkers when their team equalized vs. Lyon in the Champions League. Then to watch 50,000+ do the same thing when Lyon scored the game winner a few minutes later. -- Seeing the gangly athleticism of the Camels racing in the Camel Cup in Alice Springs. -- Having Becca find a blue and silver Xmas tree for me in Thailand, complete with decorations, Ferrero Roche “presents” and a Santa Claus "angel". 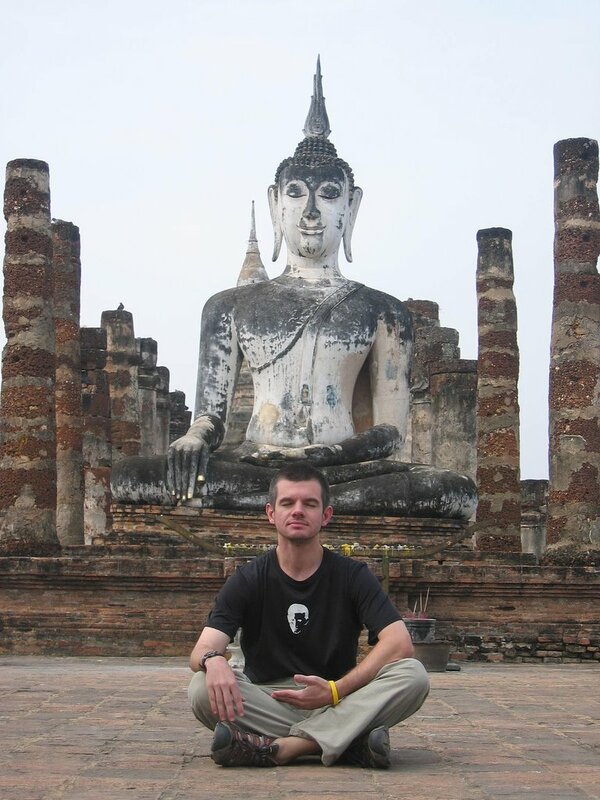 -- Our various travel adventures in SE Asia; sawngthaw, bus, moto, you name it we did it. -- Watching the native Laos women go shoulder deep into a wicker basket of meat to find just the right piece to serve us. -- Eating raclette for the first time in the shadow of glaciers and Mt Blanc. -- Seeing the shocked and pleased reactions we received once our translator let our Vietnamese hosts know we could play the local card game Ta-La. -- Uniquely observing the Vietnamese war memorials from the unusual position of someone who wasn't able to write the history. -- Getting taken in by the Shaq-loving monks in Xiahe, China. -- Debating the merits of death by cigarette v. coal smoke in our hotel room in Datong, China. -- Waking up under the sky to a breathtaking sunrise in the middle of the outback. -- Having part of the Great Wall all to ourselves and realizing that it was one of those things in life that actually exceeded the tremendous expectation you had of it going in. -- Having Melbourne still top my favorite city list after having visited 28 other countries. -- Wanting to move to Wanaka, New Zealand at first glance and still feeling that way 6 months later. -- The amazing hospitality of all of our friends during this trip. We were able to hook up with people we knew in almost half the countries we traveled it. We just consider ourselves extremely fortunate to have so many doors open for us and look forward to returning the favor somewhere down the road. So for me, answering the question posed at the beginning of this entry really can’t be done in a traditional way. Obviously people are being social and are usually genuinely curious as to what our preferences were. Sure, I can mention places I want to return to at some point. But who knows where life will take us and when we’ll have the chance to make it back? And if we do make it back, it’ll never hold the same memories. That’s just part of living life. In the meantime though I’m quite content with those moments in time that keep popping up in my head and continue to provide a bright spot in my day. For me that’s my favorite place I visited (and continue to visit) on this trip.